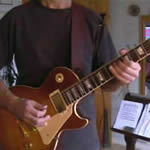 Learn lead guitar with this Guitar Tuition DVD. This DVD will have you playing lead guitar in no time at all. With 6 dedicated backing tracks included to help you master a range of styles, this DVD manages to cover just about every technique going for playing lead guitar. Don't forget to check out the rest of the learn guitar dvds, whether you're a beginner wanting to learn how to play guitar or an established player looking to expand your guitar playing techniques. Each DVD is filmed in the style of a private guitar lesson to give a natural and relaxed feel to learning the guitar. Left handed Learn Guitar DVD also available: This Learn Guitar DVD title is now available for left handed guitarists. Simply select 'Left Handed' from the drop down box on the left hand side above the 'Add to Basket' button and we will ship the 'Left Handed' version to you.